St. Paul writes over and over in his epistles is that we should always rejoice. It’s something that he says so often that I can’t help but think that the people who knew him in real life probably got tired of hearing it. 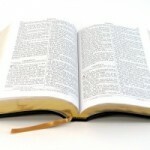 But, clearly, to Paul, rejoicing was one of the key tenets of living the Christian life. It’s something that we need to take seriously. What is Paul talking about when he says to rejoice always? I believe he is telling us to be glad about anything and everything that we can be glad about, and to think and speak often of our gladness. Now, this runs counter to normal human behavior. Folks are pretty good at rejoicing about big gains in life. But we don’t do nearly as well rejoicing about the smaller blessings that come our way each day. Now, herein lies the tragedy. In failing to rejoice in the little things, we are missing out on a whole lot of the joy and happiness in life. Let me give you a concrete example here, just in time for Valentine’s Day. Let us consider the loveliness and beautiful simplicity of The Whitman’s Sampler. The Whitman’s Sampler is one of the sure proofs that life is good. It’s amazing to me that such a wonderful source of portable happiness can be purchased for less than 10 bucks. From time to time at family dinner on Sunday I have opened a new Whitman’s Sampler to share at the table. This is a fitting end to a lovely meal with the people I love. Even my less talkative son, Seth Madison, has been known to brighten the room with his quiet smile and quick wit when faced with the irresistible perfection of a box of assorted chocolates. 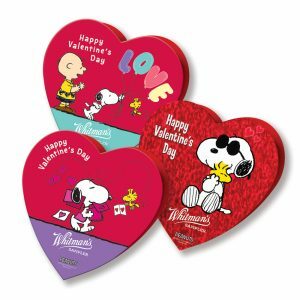 If you’re looking for something to brighten somebody’s Valentine’s Day—or any day, for that matter—just give them a Whitman’s Sampler. 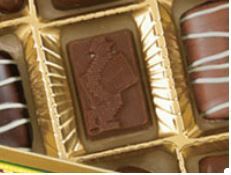 I never cease to be amazed by how many young people have never received a box of chocolates, and how happy they are when the do. The tradition is dying out, and we shouldn’t let that happen. It’s up to us to preserve it! This world certainly has its share of troubles. But it’s filled with incredible beauty, too, if you just take the time to look. No wonder Paul said so much about rejoicing. He just doesn’t want us to miss out. 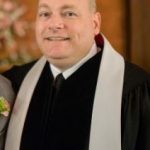 Dr. John L. Cash is the “Country Preacher Dad.” He was raised in Stuttgart, Arkansas, and has spent the last 32 years being a country preacher in the piney woods five miles south of the little town of Hickory, Mississippi. 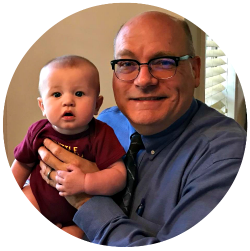 He recently retired after 28 years as a Mississippi public schoolteacher, and is now a stay-at-home-grandpa with his new grandson, Landon Cash. He and his lovely wife, Susan, live in a brick house in town (where indoor Siamese, MacArthur McBeath, decided to become an indoor/outdoor cat this week.) Their kids include Spencer (age 26), his wife Madeline (age 26), and Seth (23), and his wife Leanne (age 22). You can send him a note at brotherjohn@ilovechurchcamp.com.